I figured why not make the first challenge the exercise that I love to hate the most! 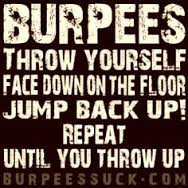 The BURPEE!!!! It's definitely my least favorite exercise, but in reality it's one of the most effective exercises and I will incorporate them into my own cardio workouts. So, here's the challenge and it starts today! You have one week to complete 1000 burpees. If you're a beast and want to knock out all 1000 at once, go for it! Or you can split them up over the week. Just get 1000 in before next Sunday!